I really like Joseph Gordon-Levitt and its been fun watching him deservedly bloom into a full-fledged movie star. I’m a huge fan of Michael Shannon and I firmly believe he’s one of the most underappreciated actors in film today. So these two coming together to star in a movie together should be pretty great, right? Well not exactly. “Premium Rush” isn’t a terrible movie by any stretch but it’s also far from being a great one. In fact if you measure the thrilling and entertaining moments against its several flaws, the result is a painfully average film with little to no staying power. JGL plays Wilee, an energetic free spirit who skipped the bar exam to go to work as a New York City bicycle courier. He flies through the city at breakneck speeds, weaving through traffic and pedestrians on his brakeless bike, for small pay but a huge adrenaline rush. Apparently there is an entire subculture of bicycle couriers who are competitive but who party together and stand up for each other. Wilee’s ex-girlfriend Vanessa (Dania Ramirez) is also a courier as is Manny (Wolé Parks), his chief rival for both jobs and Vanessa. Things turn bad for Wilee after he’s given what seems to be an easy pickup and delivery. The envelope, given to him by Vanessa’s roommate Nima (Jaime Chung), ends up containing a ticket worth $50,000. Corrupt cop and gambling addict Bobby Monday (Michael Shannon) gets wind of the envelope and sets out to intercept it. After getting in deep with the Chinese mob and some loan sharks, Monday is willing to do anything to pay off his debts. He chases Wilee through New York City using his badge as a weapon to get the money. Ok, I have to admit I had a hard time buying into a lot of this. First off, the grungy bicycle messenger community never interested me at all. Sure it was different but it didn’t even come across as believable. It’s laughable how many laws they break yet they’re able to stay in business. Wilee himself runs red lights, causes car accidents, hurts pedestrians, resists arrest, steals a police vehicle. I could go on but I suppose there is a good reason why they get away with it. The police are some of the most idiotic bumblers I’ve ever seen in a movie. There ineptitude is crucial to moving the story along but that doesn’t make it any less ridiculous. There were also issues I had with the characters and some of the performances. JGL is solid as always even though the material gets a little goofy. For example, his character has a corny time-stopping biker ESP ability that allows him to stop time and see all the available routes around a highly congested area. The first time it’s used it’s pretty cool, but after the fifth time I was shaking my head. Then there are the flimsy supporting characters and performances specifically from his fellow bikers. Ramirez ranges from flat to over-the-top. Chung is wooden and seems to resort to line reading instead of acting. Then there’s Parks’ role, a common cookie-cutter character except this time he rides a bike. Perhaps the best work comes from Michael Shannon, an actor whose got ‘off your rocker’ down perfectly. But I even felt his performance was too big and showy. But I don’t put that squarely on him. But enough of the bad. “Premium Rush” features many hair-raising scenes of bikes zipping in, out, and over New York City traffic at insane speeds. What’s really impressive is that it’s said that most of the footage is real riding and not CGI. In fact, while filming JGL was injured after slamming his bike into the back of a taxi and being thrown into the rear window. There’s an actual shot of his injury shown during the end credits. Some incredible camerawork captures all this with great technique. I also appreciate how the movie doesn’t overextend the material. The film runs a tight and concise 90 minutes which is perfect for the story it’s telling. 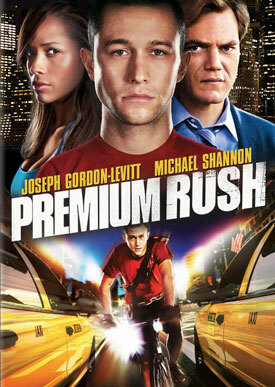 As I mentioned earlier, “Premium Rush” isn’t a terrible movie even though my review may make it sound otherwise. It’s impossible not to love the bike scenes as well as the way the camera captures New York City. Unfortunately the movie is plagued by mediocre performances, paper-thin characters, and an overload of head-scratching silliness. Regardless of how exciting the movie can sometimes be, it just doesn’t have enough pop to overcome its flaws. That’s a shame because I was expecting a lot more and there is a better movie lying somewhere underneath the shortcomings. This entry was posted in Movie Reviews - P and tagged jospeh gordon-levitt, michael shannon, movie reviews, movies, premium rush, premium rush review. Bookmark the permalink. It talks a big game about being fun and fast, however, I found myself relatively bored with this all. It’s an okay flick if you want to have some stupid fun, but there’s really nothing else here that’s worth seeing. Good review Keith. I agree 100%. There’s just too many holes and too many head-scratching moments that I couldn’t get past. I do embrace mindless fun but at some point it has to be more polished than this. I like Gordon-Levitt and Shannon but nothing about this movie interest me. Might as well just skip this one. I actually liked this one quite a bit. It’s pretty ridiculous and has a lot of plot holes, but I thought the action was well done. I can’t say I have seen a “bike action” film like this. Also enjoyed the performances from JGL and a very entertaining, over-the-top Shannon. A solid popcorn flick, nothing more, nothing less. You aren’t the only one in the minority with this one, pal. Egads. 90 minutes of mi vida I won’t get back. Yawn. So disappointed with Koepp on this one. Maybe he should do another horror flick instead. What the hell was with the whole “spidey sense” thing, too? Ok, I’m done. Good review bro! Yes!!! Spidey Sense!!! That’s the perfect description! Glad to hear I’m not alone. There were just waaaay to many head scratching flaws for me. To me it was entertaining, although forgettable. Perfect popcorn film. I can see where people would enjoy it. But for me, I have to buy into it just a little. I couldn’t. That combined with some pretty amateurish acting and its silliness kept me from enjoying it even though it was intended to be pretty light stuff.